When we say we do custom work, we mean we create what the customer wants. Whether it is a piece like Grandma had or a design of your own or simply carving your initials into one of our designs, your piece will be all yours. We also do specialty pieces for cabinet shops and production furniture groups. These pieces are usually unfinished so the shop can match the finish with the cabinets they are producing. Carving on the knee of a Queen Anne table. 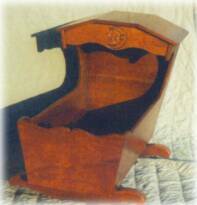 Owner's initial carved in corner hutch. Carved Logo for Art Center. 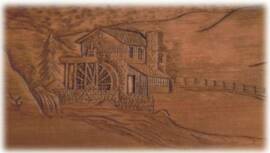 Mill Scene carved in Entry door panel. Keepsake boxes made from reclaimed American Chestnut lumber. 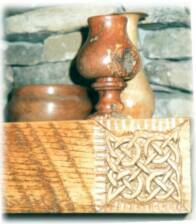 Celtic Knot carved on the end of rustic mantle. 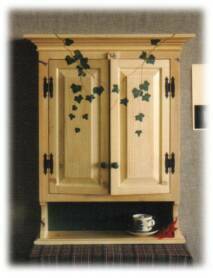 Pine Colonial Jelly Cupboard with painted Ivy. Thanks for visiting with us and check back frequently as this website is a work in progress. We will continue to post pictures of Del's work as they become available. 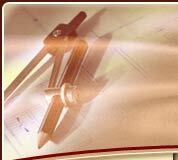 On this page you will find some of the things our customers have requested. Carvings are done by hand with knife and chisles, no router carvings on this page. Where Dreams Become Reality . . .